You’ll laugh, you’ll cry, you’ll pee a little. Need we add that this show is not even remotely appropriate for children? Written by Denny Guge, Shawna Franks, Jacque Arend and Stacy Reed. Starring Kristie Lindeman, Toni Jourdan, Wendy Warwick White and Robert Peters. Directed by BJ Garrett. First Friday Dec. 4 at 7:30 pm. 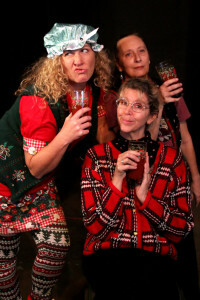 Christmas Week: Tuesday, Dec. 22 and Wednesday, Dec 23 at 8 pm.